Miishkooki Art Space, a new gallery (not quite) in town, had a jubilant opening last weekend with "Sweet Spoils," a 95-piece show of comics-inspired art from all over the U.S. and Europe. Miishkooki is the sole inhabitant of a one-story commercial building on Oakton Avenue in Skokie, where it's nestled among dental offices and insurance agencies, down the street from a dollar store and Brothers Food Market, and a short stroll from the Oakton stop on the Skokie Swift. It drew a robust turnout for the launch party, but this art-desert location will not be convenient for the gallery-hopping wine-and-cheese crowd. So who's the optimistic—or possibly delusional—proprietor who thinks art lovers and buyers will regularly beat a path to Skokie? Turns out it's someone you might recognize: John Maloof, that spiky-haired, bespectacled guy in the plaid shirt who turned some boxes of old negatives from an abandoned storage locker into the Vivian Maier photography sensation. If you saw Maloof in Finding Vivian Maier, the Oscar-nominated documentary film he cowrote, codirected, coproduced, and narrated, you'll know him right away: he looks exactly the same. Eighteen months ago, he was treading the red carpet at the Academy Awards (Finding Vivian Maier was nominated for Best Documentary Feature, but lost to Citizenfour). However, he never "went Hollywood"; when he moved, it was from Portage Park to Skokie, where his wife, Drew, is a schoolteacher. 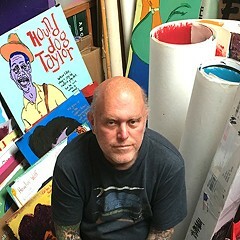 Since the film was completed, Maloof has been focusing on his own painting and music (he plays several instruments, mainly guitar, and writes songs). 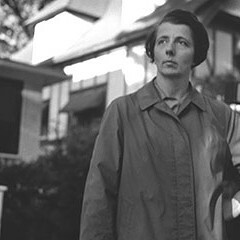 His Vivian Maier collection includes about 90 percent of her work (a recent settlement between him and the state of Illinois has him paying licensing fees to her estate, with an heir yet to be determined), but he has handed off exhibits and sales of her photos to the Howard Greenberg Gallery in New York. 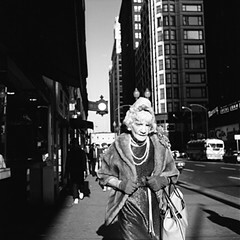 You won't be seeing Vivian Maier photography at Miishkooki. You won't see Maloof's own art in this opening show either, though a few of his pieces, mostly reverse-painted abstract faces on Plexiglass, are up in the gallery's small office. 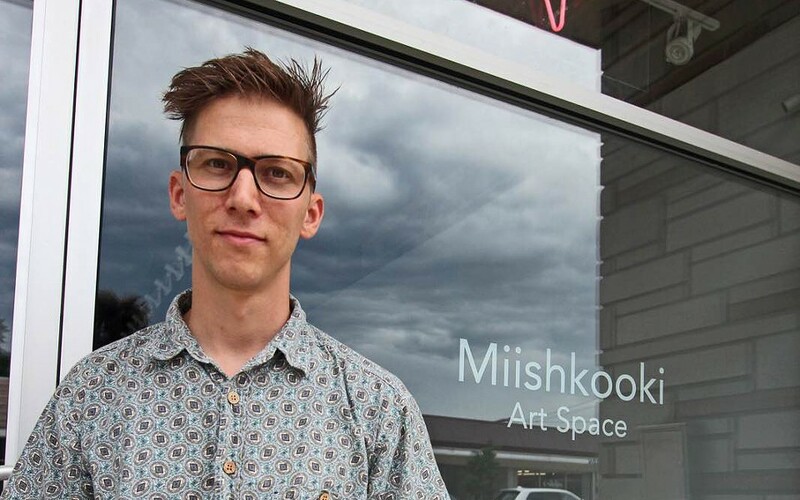 But his art is the reason Miiskooki—an Ojibwe name meaning "swamp," he says—exists. Maloof needed studio space, and thought it'd be "cool" to have a combination studio-gallery. And it sounds like the emphasis will be on the studio: after the opening exhibit, until there's another big show, the rear half of the building will be closed off and used as work space for himself, Rich Szczepanski, who cocurated this exhibit, and other artists in temporary residency. The gallery, which occupies the front half of the building, is likely to be open only by appointment. In addition to the flea-market and storage-locker chops that led him to the Vivian Maier trove, Maloof has a background in real estate. He didn't enjoy his short career in the field, he says, but it allowed him, after a hardscrabble youth, to buy the two-flat his mom now lives in. He purchased the 2,200-square-foot Miishkooki building at 4517 Oakton last spring ("Got it cheap," he says) and gutted the interior to its wooden rafters and raw concrete floor. Compared to what he could have purchased in the city, he adds, it's a big space, one where he hopes artists will curate other emerging artists and visitors will want to linger to "digest" the work. But he says he's not doing this as a business: the plan is to make Miishkooki a nonprofit so it'll be able to qualify for grants. And Miishkooki will be taking 30 percent, rather than the typical gallery's 50 percent, cut of sales. 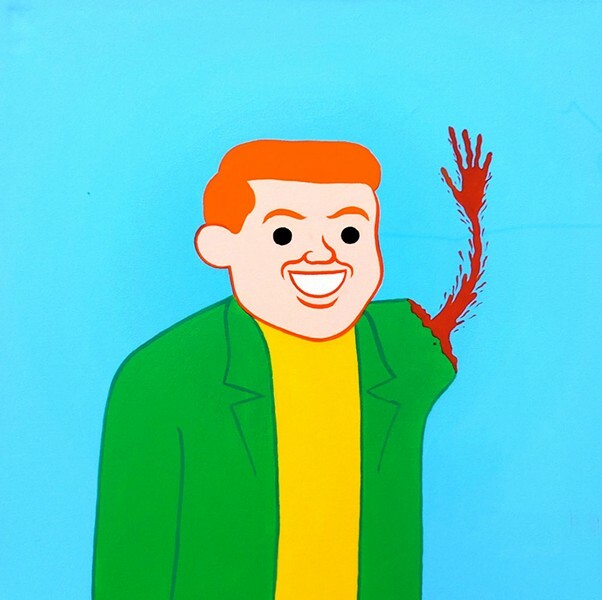 There are 16 artists in "Sweet Spoils," a mixture of friends, people he's admired, and discoveries from the Internet, with work coming from as far away as Spain (Joan Cornellá) and Germany (Angela Dalinger). None of them have regular gallery representation, and prices are affordable: $50 to $5,000, with the bulk of the material toward the lower end of that range. 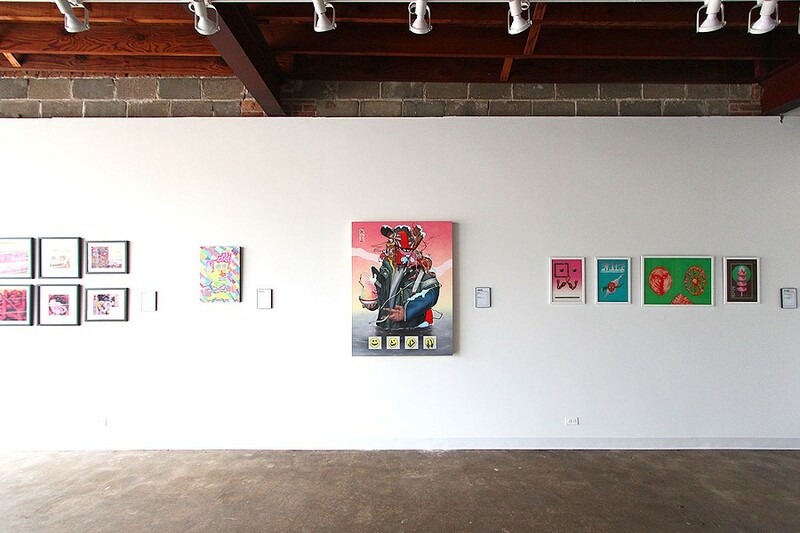 Two days before the opening, Maloof was still looking for a shipment from Brecht Vandenbroucke that was sent from Belgium three weeks ago, but the rest of the show was up, including pieces by local artists David Alvarado, Jason Davis, Nate Otto, and Joe Tallarico. What about doing another film? He'd like to, Maloof says, but there's nothing in the works. "It's easy to make a documentary, but hard to make a good documentary. My heart has to be really in it. And you don't make money on documentaries." 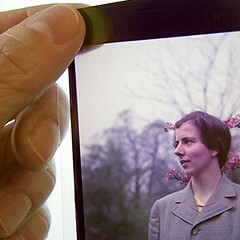 Not even on the hugely successful Finding Vivian Maier? "We paid ourselves a very modest wage," Maloof insists. "There's two directors [himself and Charlie Siskel], for four years' work. 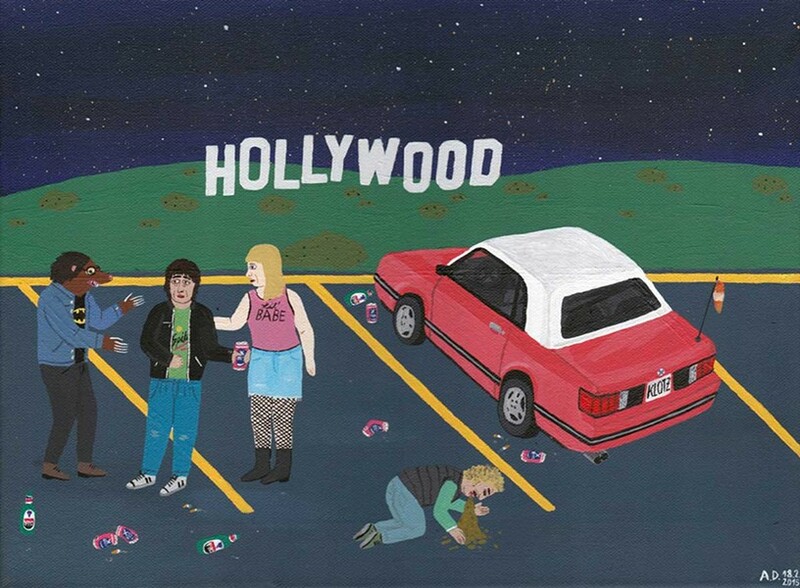 It wasn't much more than working a part-time job at a chain store." And then there's the inhibiting downside of a great debut. At Miishkooki, “Your Name Here” boasts colorful portraits of the artist’s influences.